How can we find our way through the complexities of life in the twenty-first century? Many Christians are familiar with the pointed directives of the Ten Commandments, and many will regularly read Proverbs for bite-sized pieces of God's wisdom. When we study Proverbs within the framework of the Ten Commandments, we hear both parts of God's Word speaking in ways that are refreshingly practical and eminently memorable. 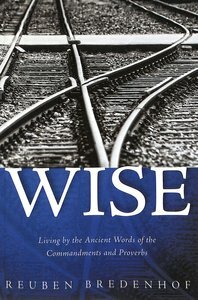 Wise shows how these ancient words relate to such diverse areas of life as worship and prayer, our words and money, marriage and sexuality, and our fears, loves, and desires. This book will instruct and encourage with the wisdom that comes from fearing God. ""Scholars have often kept law and wisdom apart, but in this interesting and contemporary study the Ten commandments and the book of Proverbs are woven together. They are written by the same God to the same Old Testament people of God, and God's values are revealed in both. Here Bredenhof applies them in a fresh and accessible way to how Christians should live."" --Lindsay Wilson, Academic Dean, Ridley College, Melbourne, Australia, and author of the Tyndale Commentary on Proverbs ""This book is biblically sound, deep, and fresh. Reuben Bredenhof has a gift for writing clear prose, making compelling arguments, and engaging contemporary issues wisely. I hope that Reformed Christians of all ages, education levels, and walks of life will read this and live by these truths that begin with the fear of the LORD. They will surely be blessed richly!"" --Theodore G. Van Raalte, Professor of Ecclesiology, Canadian Reformed Theological Seminary Reuben Bredenhof is the pastor of the Mount Nasura Free Reformed Church in Western Australia. About "Wise: Living By the Ancient Words of the Commandments and Proverbs"